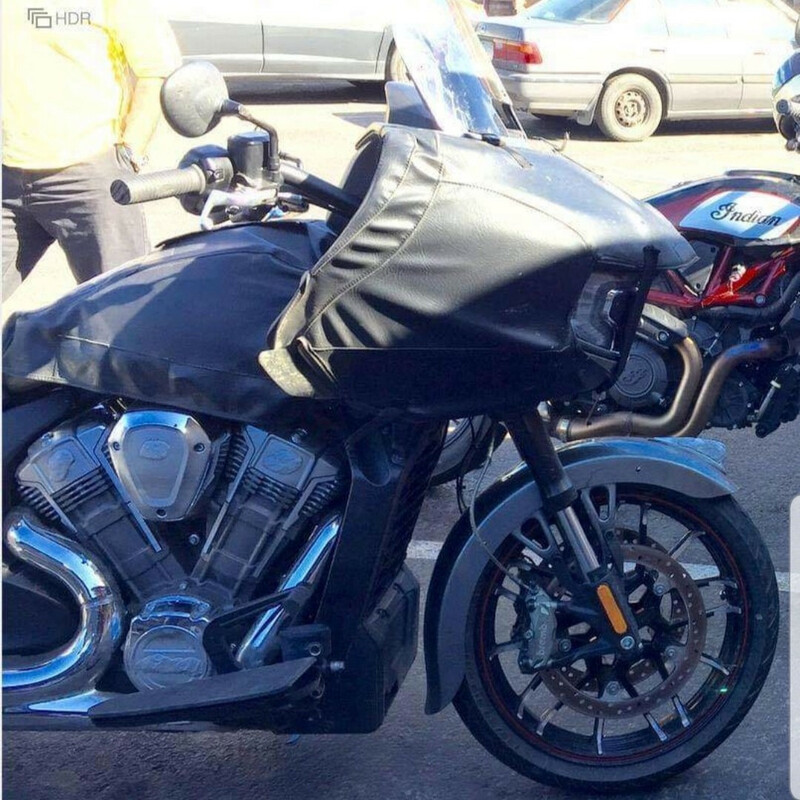 Heard a rumour that Polaris USA is testing fixed fairing touring bike with hard bags. I guess it will be a direct competition to the Harley-Davidson Road Glide? Although the engine was disguised, it didn't appear to be a Thunder Stroke engine. Maybe, Polaris is finally repurposing the Victory Freedom v2.0 engine that was tested and ready for production when the Victory division closed doors. The engine is said to be water-cooled, quad-valves per cylinder and much more high-tech than the Victory Freedom 106ci. Could this be the new Indian Raven, Renegade or Challenger??? The discussion of frame mounted fairing vs folk mounted fairing has been around for a while. You only need to ask Street Glide owners and Road Glide owners. One of the benefits of the frame mounted fairing is that your steering is light (no added weight) and they don't suffer from sudden steering pull when a big truck goes pass you. Would you be interested in a frame mounted fairing touring bike from Indian with a more modern engine? This is a very interesting rumour V. It makes sense on both counts: frame mounted fairing and 8 valve liquid cooled engine. If it's true I imagine that this would give them a 'premium' touring package that would sit above the RM, as an additional product line. I would be interested if it comes to fruition. If it's true I imagine that this would give them a 'premium' touring package that would sit above the RM, as an additional product line. I would be interested if it comes to fruition. The whisper from the shadow is that it ‘appears to be slightly smaller’ than the existing range of Indians. I was not able to ask if they meant the engine capacity or physical dimensions. Now to my own, personal, stab in the dark, guess, based on nothing concrete. Was that a disclaimer or what? 😜 IF this fixed fairing bike is the foundation of either the Raven, Renegade or Challenger... my guess is that it will be a lighter, sports touring bike. Still not able to compete with the BMW K1600 or even with the Honda Goldwing, but it would be much more nimble and leave the Thunder Stroke 116ci in the dust. Again IF this is what Polaris USA is thinking of doing, it is a clever move in my humble opinion. Why? As it was evidenced by the ‘facelift’ of 2019 Chieftain, we (the customer base) didn’t agree with the direction Polaris had taken the Chieftain line-up. If a new model does not change enough, people might say, ‘what’s the point?’ and if too much had changed, some might say, ‘it is not in keeping with the Indian philosophy or design.’ However, if Polaris launches a brand new model range like the FTR, the Raven/Renegade could be anything - maybe water-cooled, quad-valves per cylinder engine, lighter frame, performance focused and most importantly, appeals to the younger crowd!! I think Polaris is AB testing. That is, they might keep the existing range of Chiefs and Chieftains (and related models) and continue to make small changes to keep the interest alive (eg. 3 Ride Modes, Rear Cylinder Deactivation, factory 116ci engine, etc.,) over the next few years - this is ‘A’. During that time, they will possibly launch the fix fairing sports touring Indians - that would be ‘B’. Then Polaris will monitor the sales figures of A and B. If both are still climbing, great. If the sales for A is plummeting and B is skyrocketing, the A range (Chiefs & Chieftain based motorcycles) might be dropped like the Victory brand. Again, looking to the Victory brand for a clue, many Victory riders complained about the lack of model updates for about a decade before the brand was closed. No, Indian brand will not shut down any time soon. What I am saying is that Chief and Chieftain based Indian motorcycles may not continue if the facelifts or some other investments are not forthcoming. If Polaris shows some love for the aging models, there is hope. The facelift of 2019 Chieftain really did set our expectations. Which model will receive the next facelift? How will they look? Last year, Harley-Davidson announced their intention to diversify their product range with adventure bikes and electric motorcycles, as well as, eBikes. I have always thought the big v-twins are like the V8s of the car industry. They are lazy, low revving torque monsters. How many V8 cars are made today? Not a lot. We might love our bikes but Polaris is chasing profits. They want to make what sells and stop making what doesn't. I suspect we will not recognise the Indian brand in the next 10 years. That’s not necessarily a bad thing. We don't want to be like Harley-Davidson - they stopped innovating decades ago to please their core followers. HD is trying to turn things around as well. I hope Harley and Indian keep on outdoing one another for many years to come. Must be some truth in the Pics posted above as Polaris have asked the US Indian web site to remove those pics from there forum. Hmm, interesting, what looks like a scout engine with a hard fairing. Will be interesting to see what comes of it. Looks closer to the Victory Octane engine to me. Following this topic with interest. New fix fairing, new frame with built-in radiator like the Scout, new engine, new design wheels, new front guard with softer tail, Brembo brakes and it looks to have a new design tank. They cover up all sorts of things and the one thing that screams Indian (the war bonnet) is left on the fender. 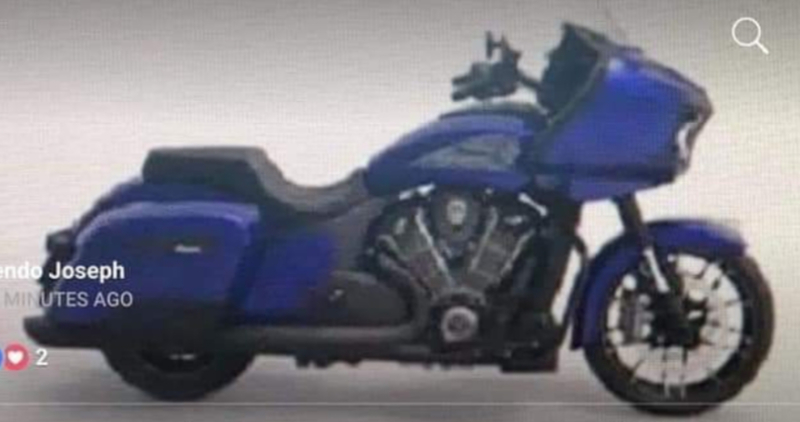 Polaris wants people to know it is them, putting covers on a tank that you could have just left the badge off,and over a fairing, that for all we know could be a cobbled up Street Glide fairing just to see how it could be mounted. But in my mind Polaris want people knowing that this is a consideration. Maybe, Polaris is finally repurposing the Victory Freedom v2.0 engine that was tested and ready for production when the Victory division closed doors. The engine is said to be water-cooled, quad-valves per cylinder and much more high-tech than the Victory Freedom 106ci. I found some stuff on motorcycle.com . 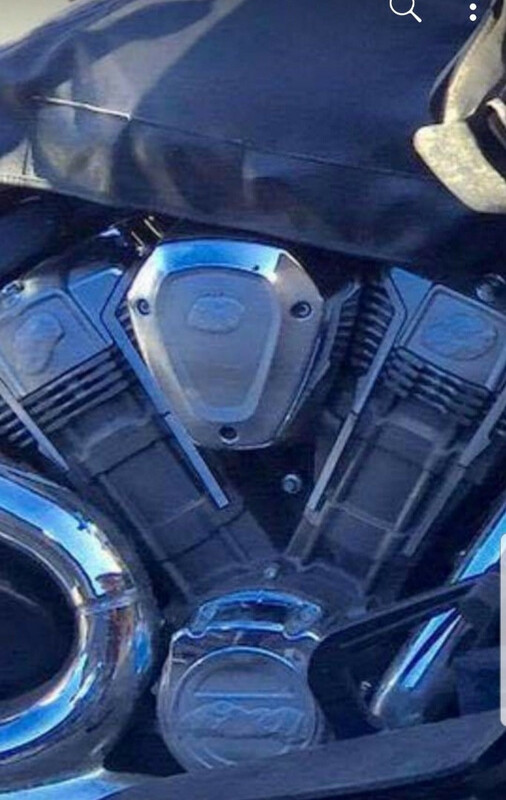 As V mentioned, the leaked photo is the new Victory v2 engine. 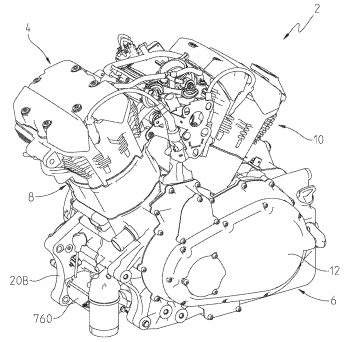 They say it will be 60-degrees v-twin, 108ci/1,770cc with an output of 120hp. I don't know if this figure is at the crank or the rear wheel, but the 116 big bore pulls about 110hp at the wheel. I hope the torque figure is just as impressive. 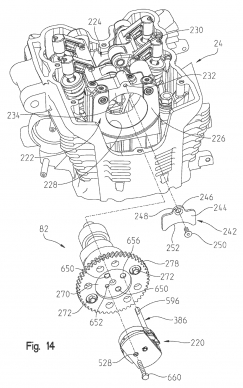 They say the patent documents show easy replacement of the single overhead camshaft as the reason for the patent. It does have a remarkable resemblance to the photograph.